Bought in 1514 from the Order of St John of Jerusalem, Thomas Wolsey acquired the site before becoming Cardinal and Lord Chancellor of England. The then private residence, with a staff of over 500, offered an opulence of hospitality and entertainments that were the wonder of Europe. 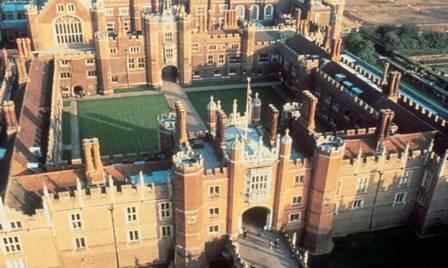 When Wolsey fell from favour, he presented Hampton Court to Henry VIII, who moved into and enlarged the Palace further from 1529. The slendour of its finest Tudor architecture and unique skyline, the Palace has dominated the landscape of the river Thames, 15 miles south-west of London, since the fifteenth century. 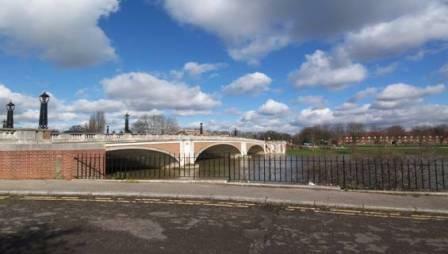 Surrounding the magnificent Palace buildings are its glorious grounds and parkland. These extensive lands, on the Middlesex bank of the river originally made up the playgrounds befitting the sport of Kings. Elizabeth I came to live at Hampton Court in 1559 a year after her accession. She kept up and improved her father's gardens, benefiting from the rare plants brought back from distant lands by Raleigh, Drake and Hawkins. A century later Charles 1, made the Palace his home for many months of the year and favouring more sophisticated entertainments whilst in residence, set about a formal programme of landscaping, introducing ornamental lakes, ponds, fountains and canals. After the Civil War, Charles’ execution, Cromwell’s death and the Restoration, Charles II moved to the Palace. He applied himself to the repair of the fineries, art and decoration of the Palace. As part of this stylish scheme, the gardens in the Home Park were completely remodeled, with the planting of Lime trees and the introduction of cascades. Samuel Pepys was a frequent visitor along with other London society, who took refuge at the Palace during the Great Plague in 1665. A year later the Palace was used again to store treasures while the Great Fire raged. In 1689 after their arrival from Holland, William and Mary set about redesigning the Palace and grounds to rival the Palace at Versailles and reflect more modern tastes. Using European influences and modern tastes, Sir Christopher Wren was set to work immediately. As well as his buildings of great grandeur, the clean air, pure water, spacious woods and elegant grounds were much desired. The opportunity it offered for the laying out of gardens, arbours and tree-lined walks, made it the favourite country home, hunting-lodge and pleasure palace of successive generations of English monarchs. Their personal tastes and the genius of their artists, architects and designers can still be seen in the buildings and gardens and in the art treasures which fill its rooms, galleries and halls. Opened in 1932 and created by the celebrated architect Sir Edwin Lutyens, its wide, shallow span, allowed for open, continuous views, across to the Palace and up and down the Thames. Hampton Court Palace has borne witness to every aspect of British Court history. Its contribution to the fabric of our historic understanding is priceless. Through the centuries, our Royal forebears have stamped their own indelible marks on the history of the Palace and its lands. The Palace that we visit today offers us all a unique window onto the Britain of the past, both Royal and lowly. This should be cherished, not only for its value to our heritage, but simply for its survival.